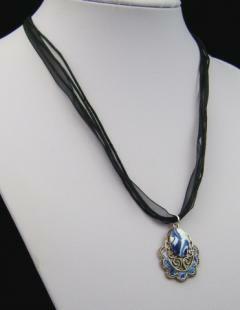 This Flower filigris pendant in blues and white has been created with intricately handcrafted canes of polymer clay. The results are always individual and cannot be reproduced, which supports my core ethos of creating jewellery which is as unique as you are. The pendant is set in an antiqued Silver Plated ornate bezel, and suspended from a multi-strand necklace of black ribbons and cords. Search through all the necklaces from all my design styles, collections and colour families.